ShakesPEERS is a unique program at the Shakespeare Theatre Company in which D.C. teens spend their afternoons exploring the work of William Shakespeare on their own terms. The PEERS find a safe environment in which they can take creative risks, find their artistic voices, build a sense of community and discover the relevancy of classical theatre in their lives. For the PEERS, Shakespeare isn’t bound inside a book for class but is an exciting part of every week. In January, the PEERS program underwent some exciting new changes. The program tripled its number of participants by expanding from its home base in the STC Education Studio into two new locations in the District: Sitar Arts Center and H.D. Woodson High School, a D.C. Public School in Anacostia. Despite being spread out across the city, the PEERS all follow the same curriculum taught by STC Education staff and teaching artists. In another new move, the PEERS’ final performance will now be chosen based on STC’s season; this spring, the PEERS will perform Cymbeline. In February, the PEERS from each site met for the first time and saw Cymbeline free of charge, looking for inspiration for their own production. After the show, the PEERS had a special talkback with the actors, where they were able to ask questions about the play and even learned a few tips about how to dispel pre-show jitters. Before their performances in May, the PEERS will unite several more times for special All Cast meetings. Together, they’ll have special workshops on stage combat, physical comedy and more. 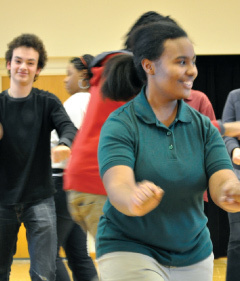 All of these changes have invigorated the ShakesPEERS program and widened the opportunity for D.C. teens to discover just how relevant classical theatre can be to their lives. You can see the ShakesPEERS perform Cymbeline May 12 in the Forum in Sidney Harman Hall and May 13 at THEARC. Emily Townsend is the Education Intern at the Shakespeare Theatre Company.